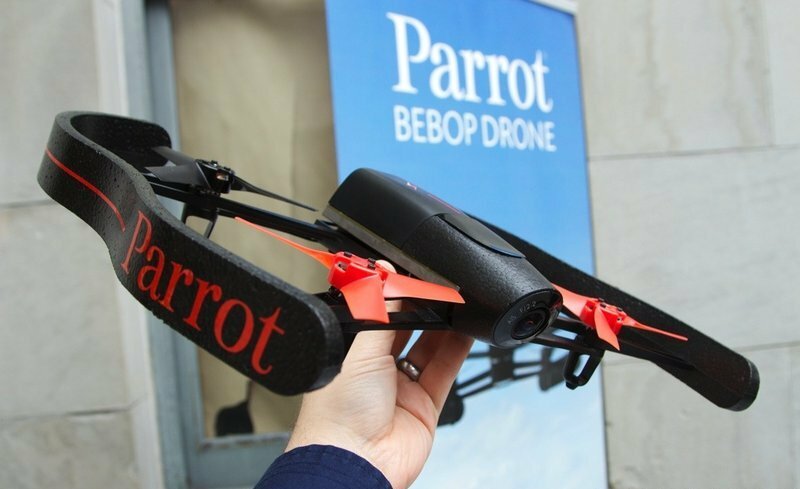 French drone maker Parrot has announced that it will add a new drone to its lineup this year. Dubbed Bebop, the new model has a 14 megapixel HD video camera, 8GB of flash memory, built-in GPS, Oculus Rift support, and more. You'll be able to control the drone with a smartphone or a tablet using an iOS or Android app, and view the recorded video in real time on your mobile device. Parrot is also offering an optional Skycontroller that attaches to mobile devices and extends the Wi-Fi range of the drone to 2 kilometers (1.25 miles). You can attach this accessory to a TV, monitor, or any other display device as well to view the video feed. Perhaps more interestingly, Bebop is also compatible with the Oculus Rift, which can be used to control the position of the drone's camera. The tiny drone, which weighs less than a pound, contains loads of sensors including an accelerometer, a gyroscope, and a magnetometer to ensure a clear and stabilized video feed. The downside of the Bebop is its battery life, as the 1200mAh replaceable battery drains after only 12 minutes of flight time. Although Parrot has not yet said how much the drone will cost, CEO Henri Seydoux said that the price for the total package will be higher than the company's last quadcopter, the AR.Drone 2.0, which sold for $300. Both the drone and Skycontroller will be available sometime in Q4 2014.